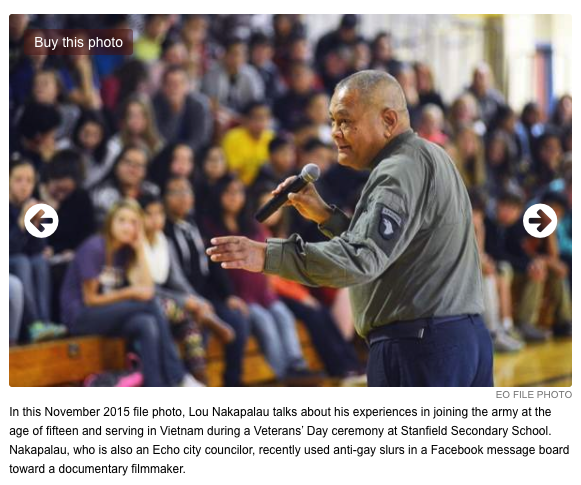 Lou Nakapalau has deleted many of his remarks, but that may not be enough for town residents. Many are calling for his removal from the city council. An Oregon town has apologized after a member of its city council told a gay man to go die of AIDS. The ensuing conversation included a number of anti-gay epithets lobbed at Wilson, which were later deleted. Nakapalau subsequently began to threaten the documentarian—whose latest film, Kumu Hina, profiles a transgender woman in Hawaii. Nakapalau has yet to speak publicly on his comments, but the Echo City council voted during its most recent meeting to issue an apology to Wilson. The board claimed that Nakapalau’s remarks do not reflect the local government’s views of LGBTQ people. Echo City council member Robert Harris claimed that the apology was the “absolute least” the town can do to make amends to the LGBTQ community. Nakapalau was present for the decision and voted in favor of issuing the statement. The mea culpa may not be enough for some. Townsfolk turned up at the Echo City Council meeting to advocate that Nakapalau be removed from his position. Local resident Jenny Sullivan told the city’s leadership that she is “absolutely disgusted” by Nakapalau’s remarks. “[A]ny self-respecting council would throw him off,” she said.